Explore the joining capability of dyed wool with auxiliary materials during the formative stages of felt making and create fresh, lyrical samples, 3-D surfaces, and fashion fabrics. Learn how to felt wool fibers through a gauzy base fabric, exploring design and various types of materials. Learn how to laminate various yarns onto lightweight knit and woven fabrics. Explore finishing or joining fabric edges without the need of a thread and needle; enhancing a store bought or hand-dyed fabric with wool designs and resulting wrinkling detail; and placing wool between layers of fabric patches to "glue" them together during the shrinking process. In addition to fabrics, certain types of washi, various papers and fused synthetics also have the potential as elements in felt art collages. Finally, 3-D motif details such as tails, spikes, loops, and pockets can sprout out of a design for whimsical impact or truly functional closure for a work, such as anchoring a cord. The genius of the wool fiber is our departure point and by a series of quick "sketches", or samples, we will work towards the completion of a neck wrap or framed art work. These techniques apply not only to airy silks, laces and gauzy cottons but heavier, woven and knitted fabrics as well, as long as the fabric has not been "boiled" or is too thick or dense. 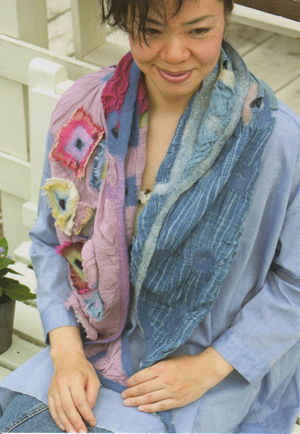 Jorie Johnson (Joi Rae Textiles) from USA/Japan is recognized internationally in the area of feltmaking. Born into a wool merchant's household, she studied textile design at RISD (USA), then KOTO (Finland). Her book Feltmaking and Wool Magic (Quarry Books) was published in 2006. Her work is in the collections of the Victoria & Albert Museum, Museum of Fine Arts Boston, and the Cooper Hewitt National Design Museum. 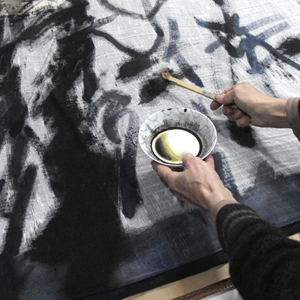 Frequently lecturing at several universities around Japan, including Kyoto University of Art and Design, she has taught workshops at conferences in the U.S., Europe, and Asia. She is a invited member of the research team of the Shosoin Imperial Household Treasures studying their 8th c. Chinese felt rugs.